"The Middle East (also called Mid East in US usage) is a region that roughly encompasses a majority of Western Asia (excluding the Caucasus) and Egypt. The term is used as a synonym for Near East, in opposition to Far East. The corresponding adjective is Middle Eastern and the derived noun is Middle Easterner. Arabs, Persians, and Turks constitute the largest ethnic groups in the region by population, while Kurds, Azeris, Copts, Jews, Assyrians, Maronites, Circassians, Somalis, Armenians, Druze and other denominations form a significant minority. ... The following countries are included within the Middle East... : Bahrain, Cyprus, Egypt, Iran, Iraq, Israel, Jordan, Kuwait, Lebanon, Northern Cyprus, Oman, Palestine, Qatar, Saudi Arabia, Syria, Turkey, United Arab Emirates, Yemen. 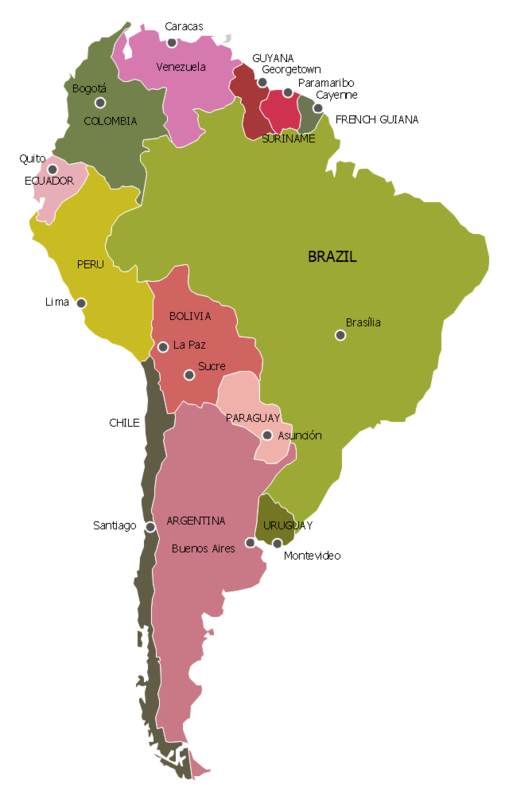 "South America is a continent located in the Western Hemisphere, mostly in the Southern Hemisphere, with a relatively small portion in the Northern Hemisphere. 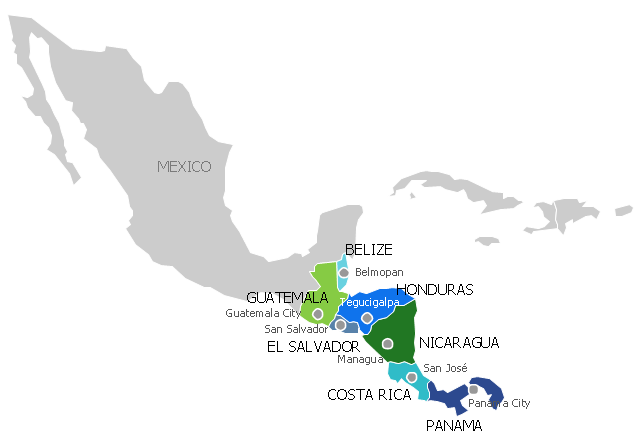 It can also be considered as a subcontinent of the Americas. "Central Asia is the core region of the Asian continent and stretches from the Caspian Sea in the west to China in the east and from Afghanistan in the south to Russia in the north. It is also sometimes referred to as Middle Asia, and, colloquially, "the 'stans" (as the five countries generally considered to be within the region all have names ending with the Persian suffix "-stan", meaning "land of") and is within the scope of the wider Eurasian continent. This Central Asia political map was redesigned from Wikimedia Commons file: Central Asia - political map - 2000.svg. 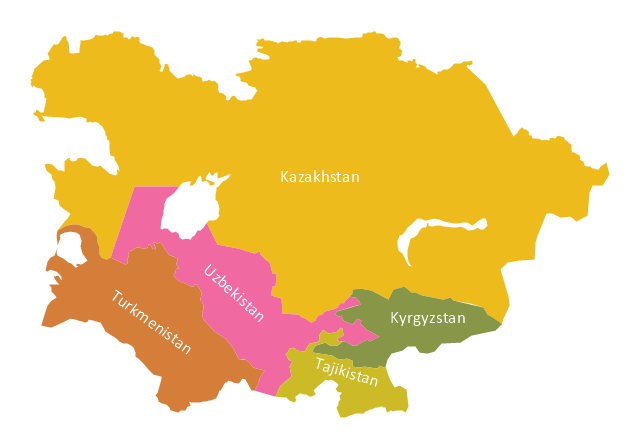 The political map example "Central Asia" was drawn using the ConceptDraw PRO diagramming and vector drawing software extended with the design elements library Asia. "The Andean States are a group of nations in South America that are defined by sharing a common geography (Andes mountain range) or culture such as the Quechua language and Andean cuisine which was primarily spread during the times of the Inca Empire, but also before and after it. 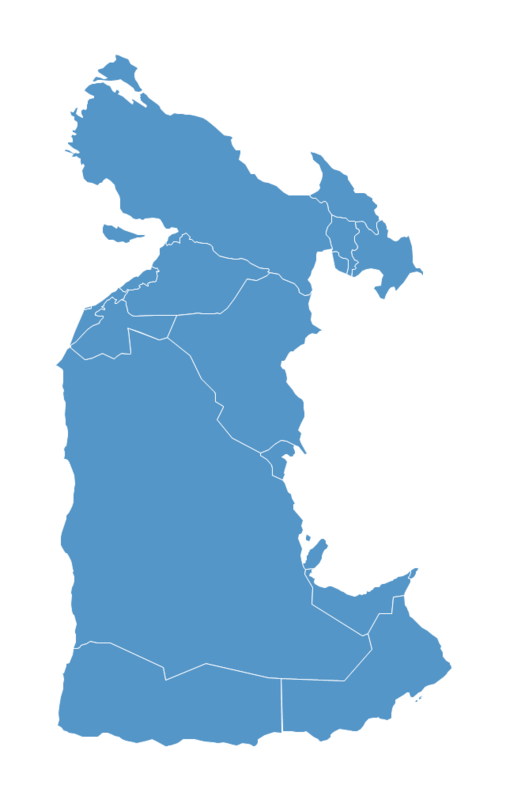 Politically speaking, Argentina and Chile are usually not considered part of the Andean States as they lack a strong native Andean heritage and are culturally more oriented towards Europe and they are not a members of the Andean Community of Nations (which Venezuela is in the process of leaving). 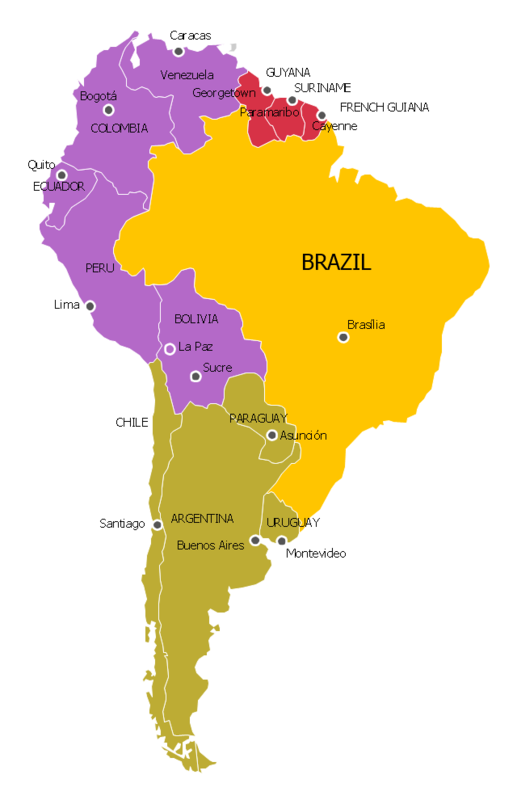 "Southern Cone (Spanish: Cono Sur, Portuguese: Cone Sul) is a geographic region composed of the southernmost areas of South America, south of and around the Tropic of Capricorn. Traditionally, it covers Argentina, Chile and Uruguay, bounded on the west by the Pacific Ocean, and south to the junction between the Pacific and Atlantic Oceans, which is the closest continental area of Antarctica (1000 km). 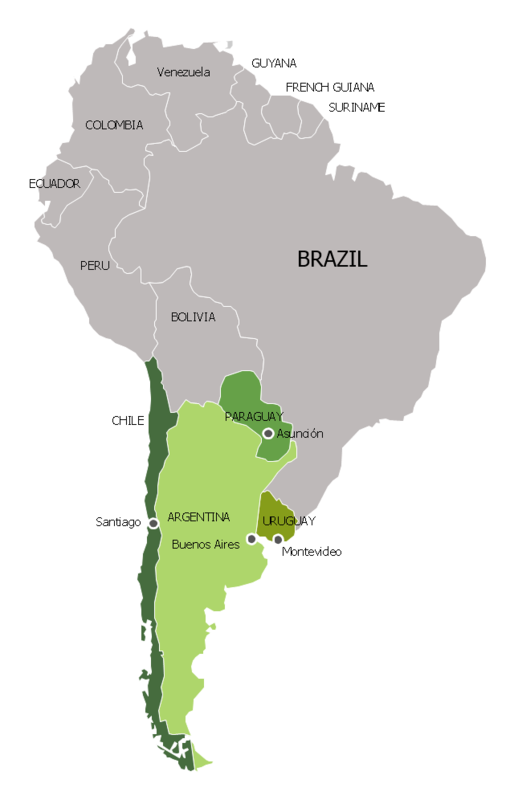 In terms of social and political geography, the Southern Cone comprises Argentina, Chile, Paraguay, Uruguay, Southern Brazil and the Brazilian state of São Paulo. 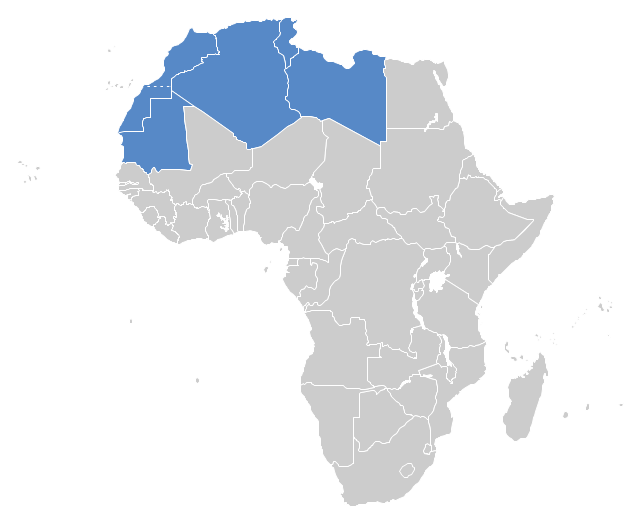 This Maghreb map example was redesigned using ConceptDraw PRO diagramming and vector drawing software from the Wikimedia Commons file: Maghreb.png. 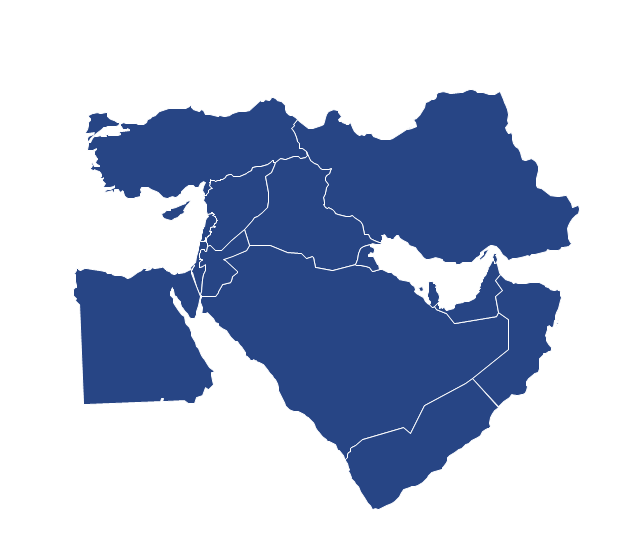 Southwest Asia region comprises countries: Turkey, Georgia, Azerbaijan, Armenia, Syria, Lebanon, Israel, Jordan, Iraq, Kuwait, Cyprus, Saudi Arabia, Bahrain, United Arab Emirates, Oman, Qatar, Yemen. This political map sample was redesigned from the Wikimedia Commons file: Southwest-Asia-map.PNG. 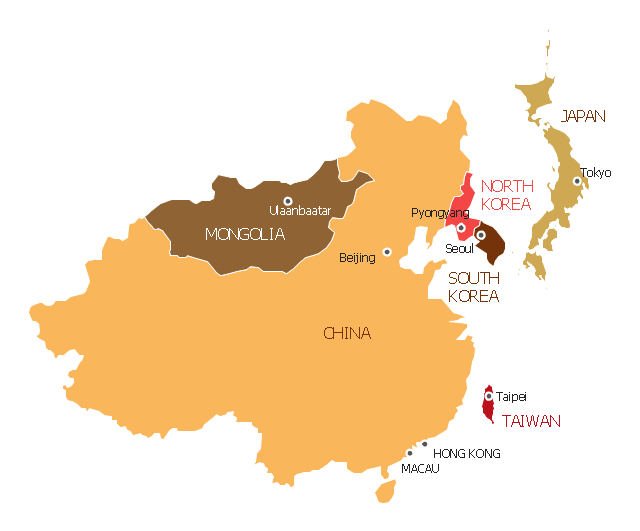 The UN subregion of Eastern Asia and other common definitions of East Asia contain the entirety of the People's Republic of China, Japan, North Korea, South Korea, Mongolia and Taiwan. 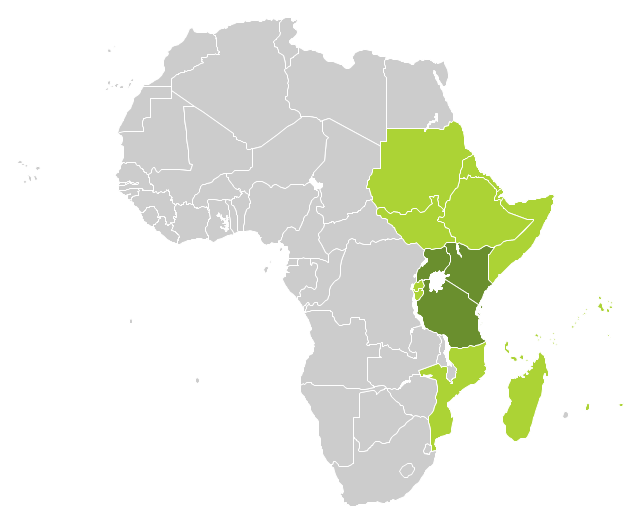 - Tanzania, Kenya, Uganda, Rwanda and Burundi – in Southeast Africa included in the African Great Lakes region and are members of the East African Community (EAC). Burundi and Rwanda are sometimes considered part of Central Africa. - Djibouti, Eritrea, Ethiopia and Somalia – collectively known as the Horn of Africa. - Mozambique and Madagascar – often considered part of Southern Africa. Madagascar has close cultural ties to Southeast Asia and the islands of the Indian Ocean. - Malawi, Zambia and Zimbabwe – often included in Southern Africa, and formerly of the Central African Federation. - Comoros, Mauritius and Seychelles – small island nations in the Indian Ocean. - Réunion and Mayotte – French overseas territories also in the Indian Ocean. South Sudan has become independent on July 9, 2011. Sudan and South Sudan are shown with the new international border between them. This East Africa political map was redesigned using the ConceptDraw PRO diagrammin and vector drawing software from the Wikimedia Commons file: Afryka Wschodnia.png.